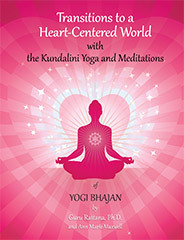 In this e-version of Transitions to a Heart-Centered World, Guru Rattana PhD brings to you, in her most popular manual, a rich and unique compilation of the original Kundalini Yoga kriyas and meditations of Yogi Bhajan. Her new and fully revised* Second Edition (2014) introduces a whole new generation of students to this powerful and life-changing technology, as well as providing many new insights for those in possession of the original. Containing the most comprehensive collection (over 100) of the sets and meditations from Yogi Bhajan’s early teachings, it is in daily use by Kundalini Yoga teachers worldwide and is often the first book purchased by new students. It offers powerful and effective techniques to both teacher and student, to empower your lower chakras and open your heart to unconditional love. The content has been fine-tuned by Guru Rattana, and distilled from her many years of both practice and teaching. Focusing on a revolutionary concept first introduced by Yogi Bhajan, Transitions explains that, instead of avoiding the lower chakras, students need to cultivate a powerful base in order to open the heart chakra and stay in the heart. In over 200 information-packed pages, you will also learn how to strengthen your navel center, bolster your immune system, attract abundance, opportunity and prosperity and, in the process, attain inner peace and happiness. Making the transition to the Aquarian Age – to an age of peace, humanity and unity. Chakra cultivation - the ascent of the Kundalini and descent of consciousness. Chapter 4, a must-have reference source for teachers and students, fully explains the basics of Kundalini Yoga. Elsewhere you will find a concise list of healthy living and cleansing tips, and a mantra guide to help both beginners and seasoned practitioners understand and fully experience the powers of the most commonly used mantras. *Corrections to the kriyas and meditations received from a number of sources, including KRI, have been incorporated.